Please have a look at the pools swimmers like you've reported near Poland. Please, report any Poland Swimming Pool not listed here. Do you know of any Pools in Poland that should be listed here? Contact us!. The best choice throughout your visit to Poland will be droping by a Poland Swimming Pool. Are you on holiday and want to keep fit and healthy? Swimia.com delivers you the easy and quickest method to acquire Aquagym in Poland near your current location. 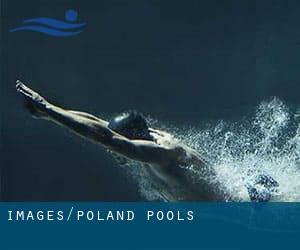 If you're looking for Poland Pools, it's excellent to know numerous of them belong to gyms or sports centers which also give lessons. Get informed by calling the premises. Please get in touch with the sports center in Poland to check which activities are being offered and their timetables, since Poland Pools may have unique rules and fares than other locations. Enjoy the best indoor pools in Poland and don't worry about the weather. These facilities are open all seasons and you can enjoy a swim at the same temperature every day of the year. There are numerous causes why you need to choose a heated swimming pool in Poland. The most necessary one relies on the importance of keeping the body temperature stable. When the water is too cold, your body will try to warm it up and you will lose strength to swim effectively. One of the benefits of outdoor swimming in Poland is the possibility to sunbathe throughout the summer season. Taking it with extra care, sunbathing is healthy since introduces Vitamin D into the body, so the ideal selection seems to be switching among indoor and outdoor pools depending on the season. There are countless alternative remedies to chlorination, with terrific advantages that ensure far better water quality in the pool. One possibility will be the mineralizer, which purifies water naturally and significantly decreases the chemicals used and maintenance time. Try Chlorine Free pools in Poland. Swimming is often a terrific idea to keep your body active throughout your visit to Łódź (Poland), or perhaps if you are a local. Swimia helps you to discover your closest Swimming Pool in Łódź. It's hard to visit Poland without dropping by Warsaw (with 1.702.139 residents). Presently Swimia is showing you all the Swimming Pool in Warsaw along with the closest pools located in its vicinity. Holding an estimated population of 755.050, Kraków is one of the most important cities in Poland. Check all the Pool in Kraków and its surrounding area. Without a shadow of a doubt, swimming in Wrocław is the finest way to unwind immediately after work. Take a couple of minutes to browse Swimia's catalog to find a Swimming Pool in Wrocław. Updated on 2019 Ulica Abrahama 10 , Praga Poludnie , Warsaw (Postal Code: 03-982). Among all the activities supplied by the center, if you are considering swimming you will enjoy 25 meters, 6 lanes, 1.4 - 1.8 meters depth, 1.4 - 1.8 meters depth, Indoors. If it is advisable to get in touch with this Swimming Pool, email address and phone number are both number. Updated on 2019 ul. Wesola 4 , Wesola , Warsaw (Postal Code: 05-075). Among all of the activities offered by the center, if you are interested in swimming you'll appreciate 25 meters, 4 lanes, 1.1 meters - 1.8 meters depth, 1.1 meters - 1.8 meters depth, Non-Chlorine Sanitized, Indoors. Just in case you want to contact this Pool before dropping by, we only know the phone number. Updated on 2019 ul. Droga Debinska 10c , Wilda , Poznan (Postal Code: 61-555). Swimmers like you reported 25 meters, 8 lanes, 2.3 meters - 2.8 meters depth, 2.3 meters - 2.8 meters depth, Indoors. Phone number and email address are number for this Swimming Pool. Plac Powstanców Slaskich 1 , Chorzow (Postal Code: Unknown). This sports center offers 25 meters x 12 meters, Indoors. For this Swimming Pool, only phone number is number here. ul. Szkolna 2 , Lask (Postal Code: 98-100). Among all the activities provided by the center, if you are interested in swimming you are going to enjoy 25 meters x 12.5 meters, 6 lanes, Indoors. If you will need to contact this Swimming Pool, email address and phone number are both number. Updated on 2019 ul. Grzybowska 35 , Wola , Warsaw (Postal Code: 00-855). Swimmers like you reported 25 meters, 4 lanes, 1.2 meters - 1.8 meters depth, 1.2 meters - 1.8 meters depth, Indoors. Unfortunately we do not have the email address of this Swimming Pool, but we can provide you with the phone number. Updated on 2019 Hotel Wodnik , Belchatow (Postal Code: 97-413). Swimmers like you reported 25 meters, 6 lanes, Indoors. Phone number and e-mail address are number for this Swimming Pool. Updated on 2019 ul.Jolenty 5 , Gniezno (Postal Code: 62-200). This sports center gives 25 meters, 6 lanes, Indoors. Contact knowledge for this Swimming Pool such as phone number and e-mail address are number. Updated on 2019 ul. Potocka 1 , Warsaw (Postal Code: 01-652). Among all the activities offered by the center, if you are interested in swimming you might appreciate 25 meters x 18 meters, 6 lanes, 2 meters - 2.5 meters depth, 2 meters - 2.5 meters depth, Indoors. If you might want to get in touch with this Swimming Pool, email address and phone number are both number. ul. Mydlana 20 , Chrzanow (Postal Code: 32-500). This sports center offers 25 meters x 12.5 meters, 1.3 meters - 1.8 meters depth, 1.3 meters - 1.8 meters depth, Indoors. For this Swimming Pool, only phone number is number here. ul. Kalwaryjska 9 - 15 , Krakow (Postal Code: 30-159). This sports center provides 25 meters x 12.5 meters, 1.5 meters - 4.6 meters depth, 1.5 meters - 4.6 meters depth, Indoors. Contact information for this Swimming Pool for instance phone number and email address are number. Updated on 2019 II Armii Wojska Polskiego 5 , Gubin (Postal Code: 66-620). Swimmers like you reported 25 meters, 6 lanes, Indoors. Phone number and email address are number for this Swimming Pool. Updated on 2019 ul. Koncertowa 4 , Warsaw (Postal Code: 02-784). This sports center provides 25 meters x 12.5 meters, 6 lanes, 1 meters - 1.6 meters depth, 1 meters - 1.6 meters depth, Indoors. Contact information and facts for this Swimming Pool such as phone number and email address are number. ul. Raclawicka 62 , Wroclaw (Postal Code: 53-146). Few days ago a frequent user of this center told us they offer Olympic size, Indoors. Furthermore, they keep in good conditions 25 meters, Indoors. For this Swimming Pool, only phone number is number here. Proszówki 365 , Bochnia (Postal Code: Unknown). This sports center offers 25 meters x 12.5 meters, 6 lanes, 1.2 meters - 1.8 meters depth, 1.2 meters - 1.8 meters depth, Indoors. Contact information for this Swimming Pool like phone number and email address are number.